Greetings! 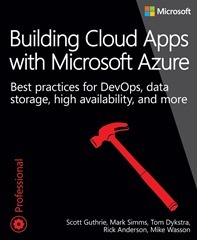 We’re happy to release a free ebook today: Building Cloud Apps with Microsoft Azure: Best practices for DevOps, data storage, high availability, and more, by Scott Guthrie, Mark Simms, Tom Dykstra, Rick Anderson, and Mike Wasson. Here are the download links: PDF (6.35 MB), EPUB (22.7 MB), and MOBI(12.3 MB). In this article, I will discuss some security elements and show you how they can be implemented in MVC applications. Hi, this is Jeffrey Richter. I was very excited when Microsoft announced universal apps for Windows Store and Windows Phone apps. One reason is that I can now use my existing C#/CLR/WinRT skill set to build phone apps. Another reason is because it means my Windows Runtime via C# book now has a new audience. In fact, the book’s content is entirely applicable for Windows Phone 8.1 developers except for the few differences described in this earlier blog post, “Windows Phone updates for Windows Runtime via C#.” I’ve already converted all the book’s code samples to universal apps, and I have them running on both Windows and Windows Phone. You can download this code from the book’s catalog page in the new Microsoft Press Store (via the Downloads tab). Building an NLayered, localized, well-structured Single-Page Web Application using AngularJs, ASP.NET MVC, Web API, EntityFramework and ASP.NET Boilerplate. This is the first in a series of Internet of Things (IoT) programs for the creation of connected devices. This program is tailor-made for both makers and Windows developers entering into the IoT space. Get an introduction to Kinect for Windows and what it can do, hear how to get and install the SDK, and see how to use included sample code to get started. In this video, Gianluca Bertelli, an Escalation Engineer from Italy, will show you how to integrate Facebook within our Windows Store Applications – Using the class WebAuthenticationBroker to authenticate the users with any authentication provider that uses Oauth2 as protocol. You will see how to create an application that emulates a Single Sign On. The last topic covered is how to deal with the token that is returned by Facebook, how to store and reuse it later.